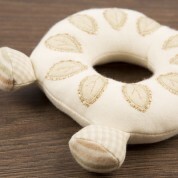 Natures Purest create each of their products using natural materials like 100% organic cotton which feels luxuriously soft and will protect your baby's delicate skin. 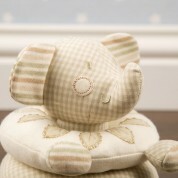 If you are looking for a different gift to give to a new mummy for her baby then why not buy Ele? Every new born gets an abundance of blankets, teddies and baby grows but will probably not have an Ele elephant. 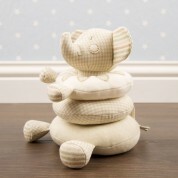 This elephant activity stack will bring lots of fun playtimes with a parent and their baby. It crinkles, jingles, rattles and squeaks. There are 3 different sized rings that come with a rattle inside and stack nicely on the Ele stand, which also has a rattle inside the head and squeaks when squeezed. Ele the elephant has beany feet for extra support and crinkle ears. 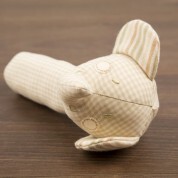 It is suitable from birth and will be a treasured gift for both boys and girls. This gift comes in a zipped round plastic bag so can be stored away when not in use. CE Tested, Sponge wash only.